The cauliflower fungus (Sparassis crispa) is quite unmistakable in its appearance being built of many layers that resemble a cauliflower or brain. The fruit body ranges from 20-50 cm in diameter and it has a short stem that attaches to a tree in which it grows. It can be found in coniferous woods and generally grows on pine trees. The cauliflower fungus grows from late summer to late autumn. 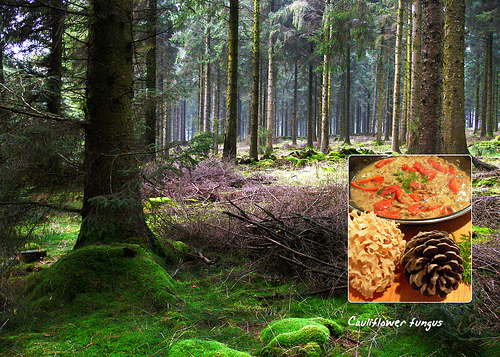 The fungus is very tasty and good for eating and also dries well. It is excellent briefly fried in butter or added to a cream sauce. An Italian friend has also used it in a risotto. a fair bit of cauliflower fungus (Sparassis crispa) cleanedchargrilled peppers250 ml chicken stock1 egg yolkpinch of garam masalaChopped coriander leavesSalt and peper Lightly dust the fungus with flour and fry in butter for 2-3 minutes. Add the chargrilled peppers, stock, garam masala and chopped coriander leaves. Reduce the liquid to half and add the egg yolk to thicken. Season to taste.